You don't need sugar to be sweet. Welcome to the first day of September! With a big day of study ahead, I decided to have my daily fruit intake with breakfast. Aware that the Summer heat is fast approaching, I knew it wouldn’t be long before porridge would be off the menu, so I decided to indluge in its deliciousness while I could. Porridge is a great Low-GI food, is more gental on the stomach than bran, and contains fibres which reduce blood cholesterol and aids digestion. If you’re dieting or trying to lose weight, don’t forget the importance of breakfast – skipping has actually been proven to be counter-productive for weight loss. This is due to the fact that your hunger will eventually kick in, and there’s a greater chance that you’ll turn to higher calorie foods to fill the gap. As well as this, small, regular meals are more easily burned by your metabolism than large, irregular meals. Wishing you all great first day of September and a Happy Father’s Day! 1. Combine water and oats in bowl. Cook in microwave for 1 minute. 2. Add chopped strawberries and banana. Sprinkle seeds and drizzle honey over porridge. 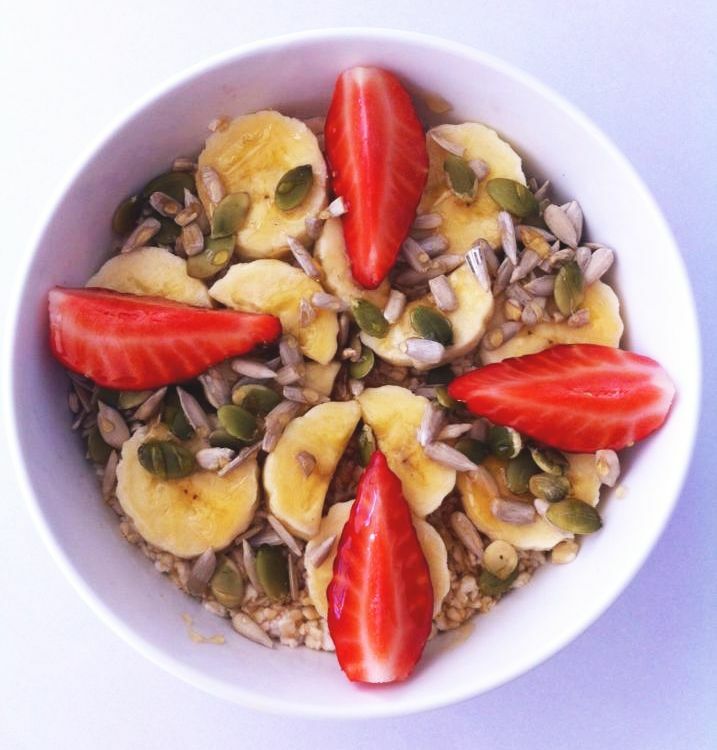 This entry was posted in Recipes, Sugar-Free, Uncategorized and tagged banana, breakfast, clean eating, Cook, determination, diet, Father's Day, fitness, health, healthy, inspiration, low-gi, motivation, Oatmeal, porridge, recipes, strawberry, Sugar-Free, Sunflower seed, Weight loss. Bookmark the permalink. It honestly is one of my favourite breakfasts. A great way to kick-start the day and stay fuller for longer. Try the recipe and let us know what you think!